(15 km southwest of Phnom Penh - Take Monireth 8.5 km past the bridge at Street 271) Many of the Cambodians who perished under the Khmer Rouge regime ended up dumped in one of the dozens of ‘killing fields’ that can be found scattered across the country. The killing fields were essentially ad hoc places of execution and dumping grounds for dead bodies during the Khmer Rouge regime (1975-1979.) After the Khmer Rouge regime, memorials were set up at many of the sites, some containing the bones and remnants of victims gather from the area. Prior to 1975, the Choeung Ek just outside Phnom Penh was a orchard and a Chinese cemetery. 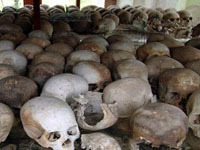 But during the Khmer Rouge regime the area became one of the infamous killing fields. This particular killing field is the site of the brutal executions of more than 17,000 men, women and children, most of whom had first suffered through interrogation, torture and deprivation in the S-21 Prison (now the Toul Sleng Genocide Museum) in Phnom Penh. The Choeung Ek Memorial is now a group of mass graves, killing areas and a memorial stupa containing thousands of human skulls and long bones. 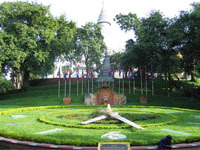 The memorial is about a 20-40 minute drive from the center of Phnom Penh. There is also a small souvenir shop as well. 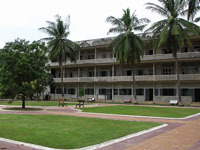 For sake of historical context, combine your trip to Choeung Ek with a visit to Toul Sleng Genocide Museum (the former S-21 Prison) in Phnom Penh. Also see David Chandler’s book, ‘Voices of S-21’ for the most systematic and complete account to date of the history and operation of the S-21 Prison. This market became the foreigner’s market during the 1980’s when most of the foreigners in Cambodia were Russians, hence the name ‘Russian Market.’ It is of far less architectural interest than the Central Market but has a larger, more varied selection of souvenirs, curios and silks. 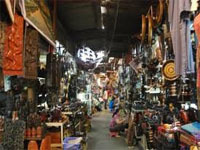 Like the Central Market, there are several jewelers and gold-sellers, but it also carries huge selection of curios, silks and carvings, it is one of the best markets in town to buy fabric, and it offers the largest selection of VCDs, DVDs and CDs of the traditional markets. Most of the DVD vendors are located on the south side near the southeast corner of the market. Most of what the visitor might want is in the same general area on the south side but the rest of the market is well worth exploring. Food and drink stands in the middle of the market for hygienically adventurous visitors. The distinctive rust-red National Museum next to the Royal Palace was dedicated by King Sisowath in 1920. 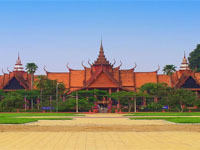 Over 5000 objects are on display including Angkorian era statues, lingas and other artifacts, most notably the legendary statue of the ‘Leper King.’ Though the emphasis is on Angkorian artifacts, there is also a good collection of pieces from later periods, including a special exhibition of post-Angkorian Buddha figures. Visiting the museum after rather than before a trip to the Angkor Archaeological Park in Siem Reap helps lend context to the Angkorian artifacts. 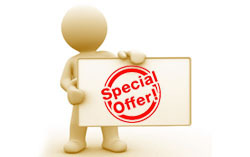 Multi-lingual tour guides are available. Souvenirs and books available. Photography is limited. The museum borders Street 178, aka ‘Artist’s Street’ which is lined with local art galleries and souvenir shops. The Reyum Gallery on Street 178 is of particular note, exhibiting the works of contemporary Cambodian artists. Marking the approach to the Royal Palace along Sothearos Blvd the high yellow crenellated wall and spired Chanchhaya Pavilion stand distinctively against the riverfront skyline. Inside the Palace grounds street sounds are silenced by the high walls and the royal buildings sit like ornate islands rising from the manicured gardens. The Royal Palace serves as the residence of the King, a venue for court ceremony and as a symbol of the Kingdom. It was first established at its present location when the capital was moved from Oudong to Phnom Penh in 1866 under King Norodom and the French protectorate, though the Palace did not attain its current general form until about 1920. 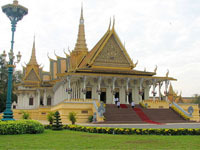 Khmer and European elements as well as distinct architectural echoes of the palace in Bangkok are present in the design of the various buildings. Attached to the Palace compound, Wat Preah Keo Morokat (the 'Silver Pagoda') is unique amongst pagodas. So named for its silver tiled floor, it is where the King meets with monks, Royal ceremonies are performed and it houses a collection of priceless Buddhist and historical objects including the 'Emerald Buddha.' And, unlike most pagodas, no monks live at the pagoda. The temple building, library and galleries were first constructed between 1892 and 1902. A small hill crowned by an active wat (pagoda) marks the legendary founding place of the Phnom Penh. The hill is the site of constant activity, with a steady stream of the faithful trekking to the vihear, shrines and fortune tellers on top and a constellation of vendors, visitors and motodups at the bottom. Elephant rides available. The legend of the founding of Wat Phnom is tied to the beginnings of Phnom Penh. Legend has it that in 1372 Lady Penh (Yea Penh) fished a floating Koki tree out of the river. Inside the tree were four Buddha statues. She built a hill (‘phnom’ means ‘hill’) and a small temple (wat) at what is now the site known as Wat Phnom. Later, the surrounding area became known after the hill (Phnom) and its creator (Penh), hence the name of the city ‘Phnom Penh.’ The current temple was last rebuilt in 1926. The large stupa contains the remains of King Ponhea Yat (1405-1467) who moved the Khmer capital from Angkor to Phnom Penh the early 15th century. Look for the altar of Lady Penh between the large stupa and the vihear. She is said to be of particular help to women. The Independence Monument (Vimean Ekareach), capital of Cambodia, was built in 1958 for Cambodia's independence from France in 1953. 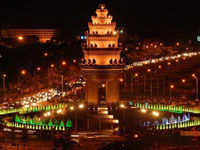 It stands on the intersection of Norodom Boulevard and Sihanouk Boulevard in the centre of the city. It is in the form of a lotus-shaped stupa, of the style seen at the great Khmer temple at Angkor Wat and other Khmer historical sites. The Independence Monument was designed by the influential Cambodian modern architect Vann Molyvann.